The class saw a tank truck like this one. It's called a "tank" truck because it has a big tank of water to fight fires. 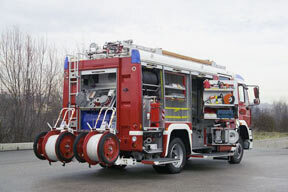 On our last field trip, we went to the fire brigade of Tegel (Berlin Airport). When we arrived, we had to wait for a fireman to pick us up, so that we could enter the security area. They had a volleyball court in front of one of the buildings. And there was a basketball court in the garage, where they keep up to 16 vehicles. Our class got split into two groups with 15 persons each, in order for the firemen to guide us through the facility. The group, that I was with, went upstairs to the central office. First, we went past the kitchen, the TV room and the accommodations before we arrived in the central office. There were surveillance cameras, a weather radar and five other computers. If bad weather came up, they would get a message from the weather station. The central station is directly connected with the Airport Tower and the fire brigade of Berlin to be better prepared for bigger fires. For example about 3 or 4 years ago a helicopter crashed into a military base near the airport and the firemen arrived there in less than a minute. They have to be able to reach every angle of the airport within 3 minutes, even though Tegel is about 4.4 square kilometers (2.7 square miles) large. The firemen don’t only have to extinguish the fires they also have to maintain the fire extinguishers from the entire airport. Besides that, they have to take measures for fire prevention and provide a rescue service. In order to keep themselves in shape, the firemen have one hour of workout a day; and in summer they additionally run around the airport (that’s about 13 kilometer or 8.1 miles) once a day. The chief of the fire brigade of Tegel showed us the “Panter”, a kind of tank which weighs 40,000 kilograms (about 88,000 lbs.). It can drive up to 120 kph, has 1000 HP and its water gun on top of the roof can shoot 80 meters (87.5yards) far. The “Panter” also has a radio connection with the Tower and the fire brigade of Berlin. The chief also showed some of their special equipment too. For instance a very expensive infrared camera which is designed to distinguish a fire-source from a big cloud of smoke. It costs about 10.000. The field trip was very interesting.